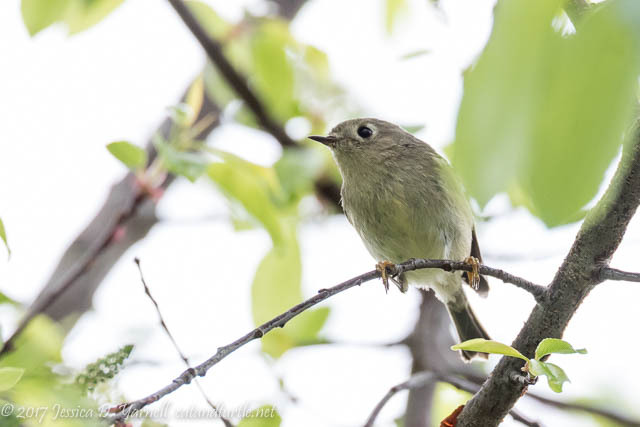 Recently on eBird a Golden-crowned Kinglet has been reported at Oakland Nature Preserve. ONP is just a few minutes from my house, and it’s hitehere I learned the basics of digital bird photography. I have many happy memories of sitting with Rich at the Painted Bunting feeders, waiting for a glimpse of a male. So on Sunday I decided it was time to head back to ONP and hopefully score a lifer kinglet. The Golden-crowned Kinglet is a rare bird in Florida. It has been reported in the trees at the entrance of the boardwalk. You hear it before you see it. Turns out, there are lots of little birds flitting around. Even though I know I saw it flit from tree to tree, and I heard it repeatedly, I never got my camera on it. Oh well. It counts as an ABA lifer but to me it doesn’t count unless I get a photo. 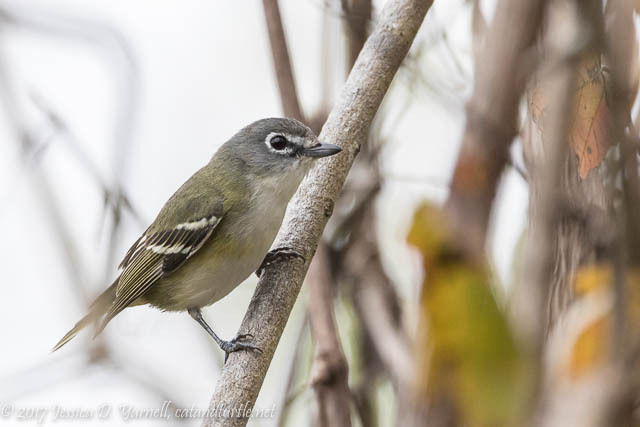 Ruby-crowned Kinglet – the more common kinglet found in Florida during the winter. The top of his head is bright red, if you can get him to show it to you! 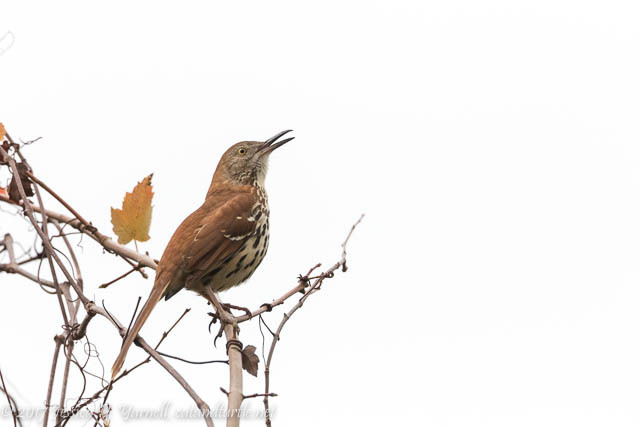 Then I heard the happy song of a Brown Thrasher. His song sounds like that of a mockingbird, but sweeter. I looked around and there he was, perched out in the open. 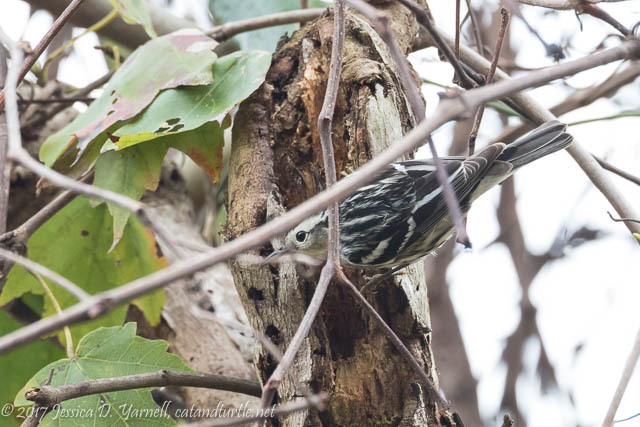 A Black-and-white Warbler hopped onto the thrasher’s tree and started moving down. It’s been a while since I’ve seen so many of these little birds! I saw a Downy Woodpecker deep inside a tree, and didn’t try for a photo. 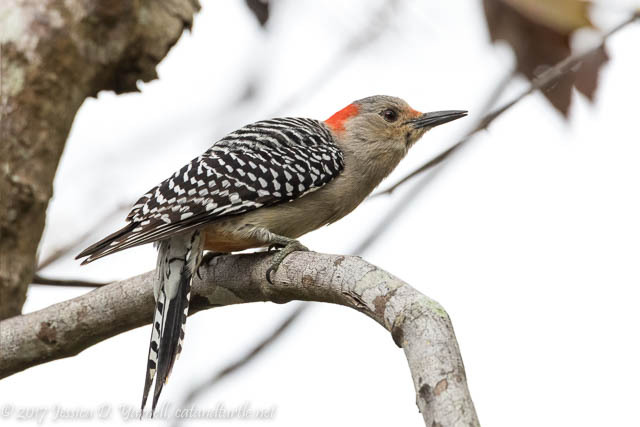 But when this Red-bellied Woodpecker hopped right out in front of me, I couldn’t resist. Common birds often lead to better birds. After I focused on the Red-bellied, I spotted a Pileated Woodpecker in the distance. He flew in closer and posed. 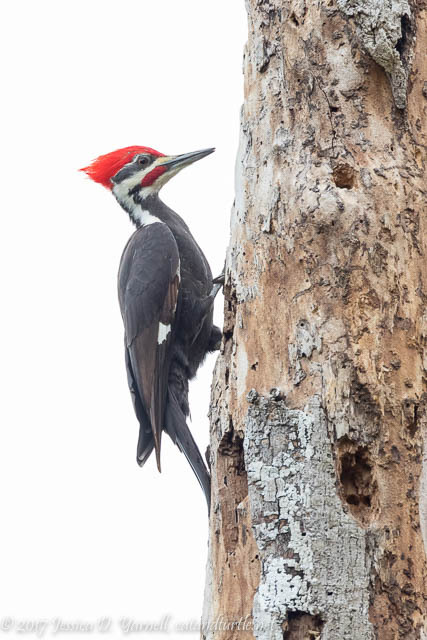 Then I saw a second Pileated. Nice! They’ve done a lot of good improvements at Oakland Nature Preserve in the past few years. They’ve added a lot of native plants near the parking area, and they maintain a bunch of feeders. 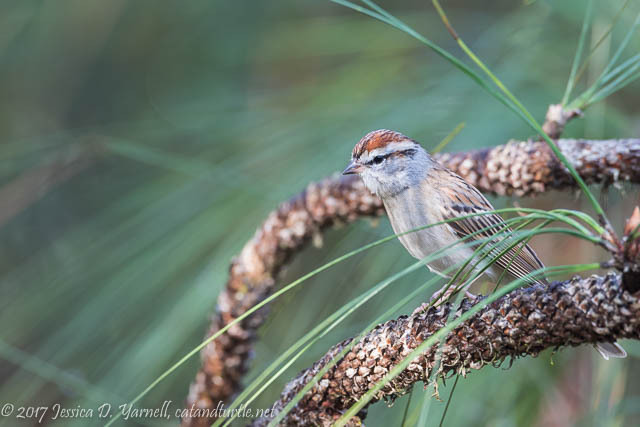 As I wandered looking for the flock of birds that the Golden-crowned Kinglet was hanging out with, I spotted this Chipping Sparrow. He wanted me to get out of the way so that he could enjoy his feeder! 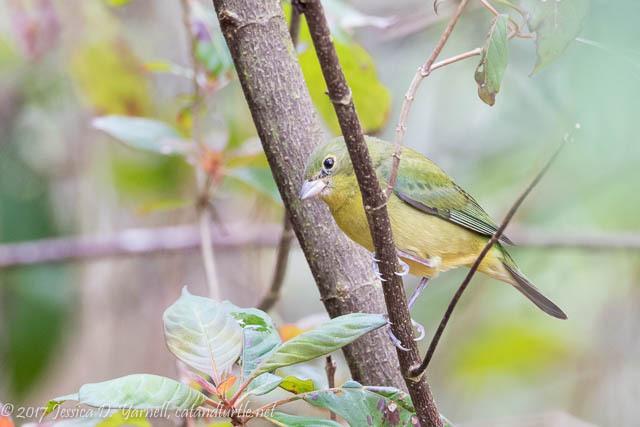 I heard a Painted Bunting call note, and then spotted this greenie not too far away. It’s nice to see one in the wild, not on a feeder! 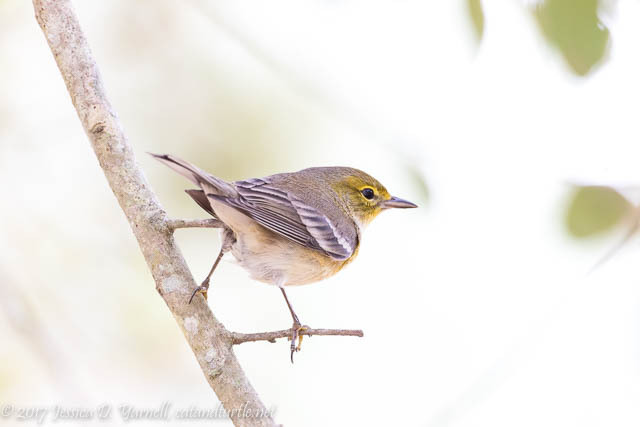 I turned around and noticed a Pine Warbler perched low on an open branch. Score! I fired off a few shots before he flew off. The parking lot started to fill with cars, and suddenly there were more toddlers on the trail than birds. Time to call it a day! I will have to try again for the Golden-crowned Kinglet. I will let you know if/when I find some cooperative colts. It’s a shame that last year’s nest isn’t active this year!